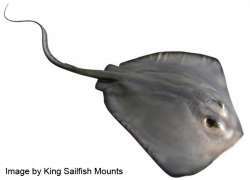 Rays are muddy brown, flattish with a long tail and diamond shaped. The stingray feeds on crabs, fish, worms, and shrimp. Commonly found around Florida and the northern Caribbean waters, but are found as far north as New Jersey. Most species lay on the soft muddy bottoms along flats and shorelines. Averaging 5 feet of span the Stingray can weigh as much as 200 pounds.